Sir William Campbell, Chief Justice of Upper Canada (1925-29) famously presided over the ‘Types Trial’, which set new precedents for Freedom of Speech and Freedom of the Press laws in Canada. By merging the text from Canada’s newly passed Bill C-51 (‘Anti-Terrorism Act’), which strikingly diminishes freedom of speech for Canadians today, with sashes that mimic those worn by the Chief Justices of the Supreme Court, Sashay Away, questions notions of justice and democracy in contemporary Canadian society. 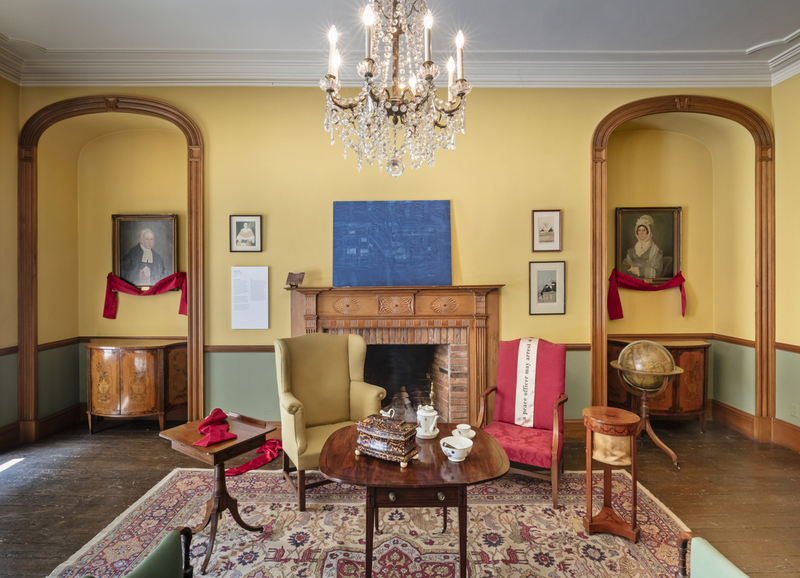 Placed throughout 'The Campbell House' a historic site in downtown Toronto, the sashes disrupt the staged historic displays, enacting the messiness and disorder that are common in lived spaces. Through the act of appropriating the judicial symbol of the sash as a stand in for spilled tea or piles of laundry this authoritative object is transformed into a campy one. This shift also allows the questionable language of the Bill to be parsed out and disarmed from its official status, which in turn encourages a different reading of its implications. By immersing the bill within the architecture and interior spaces of the historic site itself Bambitchell expose the ways the bill limits the same freedoms that Campbell House seeks to represent.